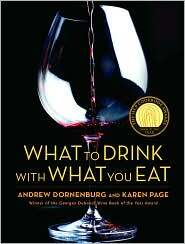 What to Drink with What You Eat is an expansive guide for pairing food and beverages crafted by top notch sommeliers who look beyond the standard pairings you undoubtedly know. The book is organized like an encyclopedia with the first half being organized by food type and the second by beverage type. We found this extremely helpful the few times we’ve had a special bottle of wine we wanted to craft a good meal around. The listings are alphabetical and then contain typically several suggestions for beverages with a system of caps and bold to highlight which pairings work best. The book is very thorough changing the pairing suggestions based on the cooking type and accompaniment. The section on lobster for example has general pairings, those for a cold meal, with cream sauce, with curry, fricasseed, with ginger, grilled, mousse, roasted, sandwiches, soufflés, steamed with butter or lemon, with Thai spices, and with vanilla! Then if that were not exhaustive enough it gives a list of wines to absolutely avoid. Refreshingly the book also goes far beyond wine pairings, as the title would suggest, to include beer, spirits, and everyday drinks. Even with these, it goes for detail describing the type of beer one should eat with a smoky barbeque (Amber, Lager, or Wheat). This food pairing guide is very thorough and easy to use and should become a must have around anyone’s kitchen.